Dozens Killed, Hundreds Injured By Earthquakes In China : The Two-Way The strong temblors also destroyed hundreds of homes in Gansu province. Rescue operations have been complicated by downpours and aftershocks. 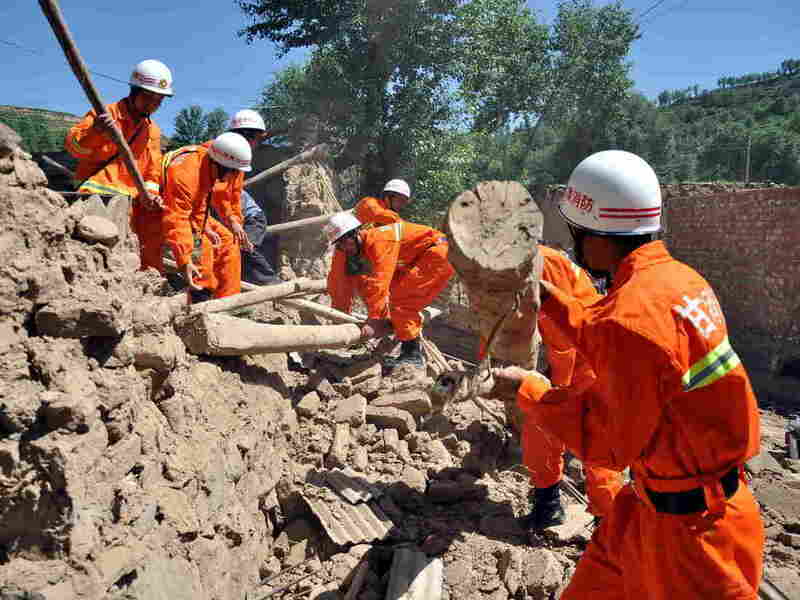 Rescuers clear debris Monday in China's Gansu province, where dozens of people were killed when earthquakes struck the region. The death toll is climbing after two earthquakes that struck western China early Monday. More than 70 people are dead and at least 400 others are injured in Gansu province, the BBC says. According to The Associated Press, China's state media say the death toll stands at 75. The U.S. Geological Survey says the first temblor registered a strong 5.9 magnitude. It struck around 7:45 a.m., local time (Monday evening in the eastern U.S.). The second quake, with a magnitude of 5.6, was felt about an hour later. The BBC adds that "at least 5,600 houses in the province's Zhangxian county are seriously damaged and 380 have collapsed, while some areas suffered from power cuts or mobile communications being disrupted, the earthquake administration added." The area is about 770 miles west of Beijing. China's Global Times writes that "days of downpours and a series of aftershocks have added difficulties to rescue efforts. ... Aftershocks and minor landslides with falling rocks were seen in the mountainous region following the quake."